Alyce's World: Not For Sale! As stated before we had a garage sale this past weekend. The sale was a big success for us. We got rid of a lot of clutter and got some decent money for things that would have probably been thrown out anyway. One item not for sale was Alyce's slide. This slide was a hand me down and probably one of Alyce's favorite toys. It usually resides in the garage and during the garage sale we had it on the sidewalk to keep it out of the way. Apparently these things are hot items as Mom continued to be asked what we were wanting for the slide. Mom put a sign on the slide stating that it wasn't for sale. This is when things get interesting. All of the signs we used for the garage sale looked just like the sign that Mom had put on Alyce's slide. And Alyce doesn't know how to read but she did try as she would get close to the sign looking at the letters. 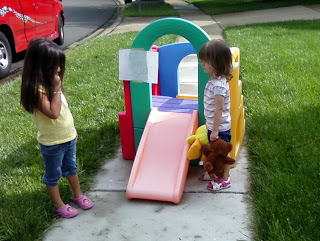 She mush have made the inference that her beloved slide was up for sale. Whenever a would be shopper would park in front of our house Alyce would protect her favorite toy by running up to her slide and putting her hand on it while giving the new arrival a mean look until they walked by. We told Alyce that her slide was safe and after a while she eventually did get the message. She would no longer guard her slide like a bear with cubs but she didn't like it when other kids would play on or around it. 0 comments on "Not For Sale!"